So recently images of Zachary Levi’s portrayal of the DC hero called Shazam graced the Internet and it got some people excited. Some thought Levi’s suit was an excellent portrayal while others criticized the suit for being a bit too cartoonish for a live action movie. Me, I’m glad the photo came out because I forgot the movie was happening overall. Shazam or Captain Marvel as he was previously known is a popular DC hero whose origins trace back to the Golden Age of Comics but this is his first time on the big cinematic screen. So to help give the non-nerdy people context about who the World’s Mightiest Mortal and the Shazam Family are, here’s 5 appearances of Captain Marvel aka Shazam that should not only inform you but get you excited for the movie’s debut on April 5th, 2019. SHAZAM! Captain Marvel’s second (although first formal modern) animated appearance was in the DC Animated Universe during the Justice League Unlimited series. In the episode titled “Clash”, Captain Marvel voiced by actor Jerry O’Connell joins the Justice League but his positive and at times naïve opinion about Lex Luthor and his attempts to reform strains his relationship with the League, specifically Superman. The tension culminates in a harsh battle between Superman and Captain Marvel over Luthor’s latest project, Lexor City and their conflicting opinions about Luthor’s innocence. Although Captain Marvel was proved to be “correct” and Superman apologizes for his actions, Captain Marvel resigns from the Justice League, highlighting his disappointment in how he used to look up to the Justice League and Superman and his disgust for what the League has become. Captain Marvel’s fifth and more frequent modern animated appearance was in Cartoon Network’s Batman: Brave and the Bold series. In this rotating guest spot, Captain Marvel was voiced by actor Jeff Bennet and his alter ego Billy Batson was voiced by actress Tara Strong. Not only did he help Batman fight the occasional villain, this portrayal expanded on the character and his rich universe. In “The Power of Shazam”, we learn about Captain Marvel’s Fawcett City and his struggles with Dr. Sivana and his family, the evil Black Adam, the immortal wizard Shazam, the bitter Aunt Minerva and his sister Mary Batson aka Mary Marvel. In “The Malicious Mr. Mind!” we see Batman and the Marvel family take on Dr. Sivana, the alien Mr. Mind and the other member of the Monster Society of Evil. He would work alongside Batman and other heroes and eventually bec0me a member of the Justice League International. The right mix of goofy and serious, this interpretation of Captain Marvel was both accurate to the comics portrayal but also balanced the juxtaposition of Captain Marvel’s powers and responsibility with Billy’s child-like optimism and innocence. It’s also one of my favorite depictions of the character and one I recommend for those unfamiliar with the Big Red Cheese. Captain Marvel’s seventh and other frequent animated appearance was in Cartoon Network’s other DC Comics series Young Justice. He is a member of the Justice League and he volunteers to be the den mother to the Young Justice team after Red Tornado abruptly leaves the position and team. This version of Captain Marvel shows him acting more like his Billy Batson who is 10 years old at the beginning of the series who seems to prefer hanging with the group of younger heroes instead of the Justice League. Billy idolizes the team and prefers to spend time in Mount Justice even when he’s not on monitor duty, seeing them as peers closer to his own age. A few episodes reference or allude to him living with his uncle in Fawcett City instead of at a foster home and even his tiger Mr. Tawny makes a cameo. His youthful nature is constantly used against him by the team who find it a little too easy to confuse and manipulate him when necessary. This version of Captain Marvel is important because Billy Batson ages throughout the series storyline. He goes from 10 years old in 2010 to a 15-year-old by 2016, a change indicated simply in size since his attire has changed very little. Although the series doesn’t go deep into Captain Marvel’s mythology or backstory, the idea of the World’s Mightiest Mortal being a den mother to a group of young teenage superheroes is an amusing concept worth viewing. 4. Superman/Shazam! : The Return of Black Adam: (2010) This short animated film centers on Superman and Captain Marvel aka Shazam, voiced by returning actors George Newbern and Jerry O’Connell, joining forces to deal with the returning threat of Black Adam, voiced by The Mummy actor Arnold Vosloo. At only 25 minutes long, this short-animated story reiterates the story of the Wizard Shazam, his mistake in appointing Black Adam as one of his champions, Black Adam’s return from exile and Superman’s vulnerability to magic which gives characters like Shazam and Black Adam an upper hand in battle. This version also introduces a silver age Captain Marvel character known as Tawky Tawny, a humanoid tiger and companion of the Wizard Shazam. For those not interested in watching the animated series, this simple but enjoyable film is the perfect introduction to Shazam for those of any attention span. 5. 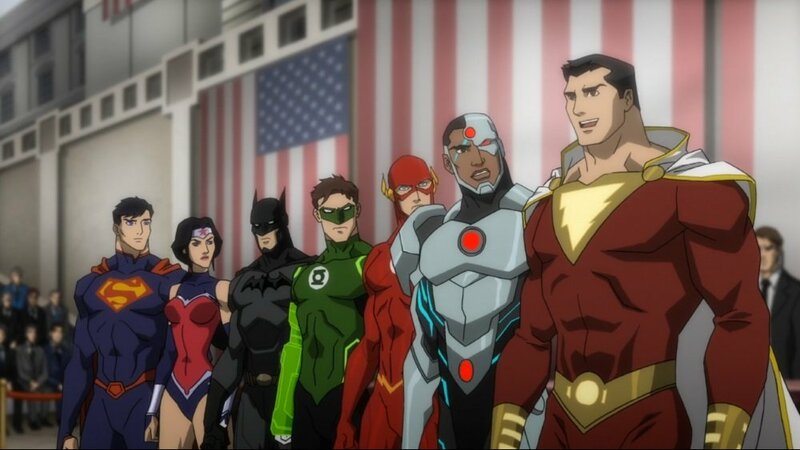 Justice League: War (2014): In this adaptation of Justice League: Origin by Geoff Johns and Jim Lee, the presence of Captain Marvel was an original idea and not one from the film’s source material. He replaced the original member Aquaman who would be featured later in Throne of Atlantis. Orphan Billy Batson sneaks out of his foster home to watch the football game that Victor Stone plays in who he memorably interacts with after the game. Later Billy’s foster home is attacked by Parademons forcing him to transform into Shazam voiced by actor Sean Astin. He fights alongside the Justice League and despite some impulsive actions on his part, his mystical lightning bolt is the missing ingredient that helps Cyborg return Darkseid to Apokolips. Depowered, he and Cyborg have a moment where Cyborg agrees to keep Billy’s secret from the League. Referencing Shazam’s membership with the Justice League in the past, this version balanced the bratty kid of Billy Batson with the star struck adult burdened both with the responsibility of his powers and learning to play well with others. So I hope that helps you on your journey to learn more about the hero that Dr. Sivana calls for some reason “ The Big Red Cheese”. I hope the new movie properly balances the proper levels of seriousness and fun that I always associate with Cap… I mean Shazam and his family of superheroes. Until then, enjoy this clip from Batman: Brave and the Bold that a younger part of me relates to in more ways than one.